Voicesafe-36 is available in 2 categories. Voicesafe-36 - Classic Version (Dashboard Installation) VOICE command Car engine start. Memory 4 voice prints. Voicesafe-36 - Elegant Version (Dashboard +Door Installation ) VOICE command car engine start & VOICE command for car entry. Voicesafe-36 (Live Voice detection) can be installed in 2 ways. How secure and accurate is voice biometrics ? We do not take risk with your car so Voicesafe-36 uses the best and most reliable technology in Voice biometrics. We provide the best technology and guarantee you best security and money back guarantee not on your product only but also on your car if the system fails to secure your car. We are serious about this and this is not merely a statement. "We mean what we say" and believe in the technology we offer you. Voicesafe-36 is fail proof and tested system. We do not risk & stake our business reputation and brand. If we were not convinced we would have never introduced Voice security for cars. Voicesafe-36- "Trust us we offer you the best"
The product "Voicesafe-36" helps you secure & start your car with your voice. Memory capacity to store 4 persons Voice. Each person has a unique voice just like a unique fingerprint. The voice of the person who wishes to drive the car is stored in Voicesafe-36 by making a person read a small sentence. Once the persons voice is stored it then asks the user to verify his voice by saying any word of his choice to test if enrollment is successful. Voicesafe-36 then checks for Live voice detection & it then verifies the voice with the voice sample it has stored. If both the voices match then the user is granted access & is termed as authorized user. He can now start the car. 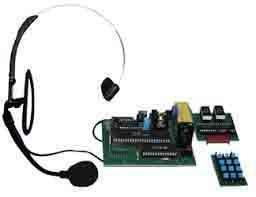 Voicesafe-36 can store 4 voice prints/voices thus enabling 4 persons to drive the car. Voices can be added & deleted by the authorized user. If the voice does not matches with those stored in "Voicesafe-36" memory then access is denied and the car cannot be started. The car does not start as it cuts of fuel supply if the voice does not match,ie no unauthorized person can drive the car. Fake voice or imposter is identified & auto dialer alerts the owner of the car. You can Start your car with any word or phrase of your choice. (Secret voice password) Feel free to use any word of your choice. Once stored in memory it shall use and verify that. Similarly you can use any (Secret voice password) word, number, phrase of your choice to switch off the car. After your voice is identified & verified the car will stop. Will Voice-safe36 still start my car even if i have cold or a bad throat? Yes the system Voicesafe-36 works even if you have cold or a bad throat. It looks for vowels in your voice commands or sentence and identifies them. The pitch or the method of speech does not affect. Well so you can still drive your car if you are not well or have a bad throat/cold. Not all of the parts that make up your voiceprint are affected by a cold; the voice verification engine can still verify a caller that has a common cold. Serious throat illnesses such as laryngitis also Does Not Affect system performance of Voicesfae-36. Voice verification is similar to fingerprinting. Everyone has a unique voice just like everyone has unique fingerprint. It has been proven that each person can be identified by the unique features of his or her vocal characteristics and speaking patterns. A recorded voice or an imitated voice of any person or even of the genuine car owner CANNOT be used to start the car as Voicesafe-36 identifies the intruder/imposter. Thus securing the car. Only original voice is accepted and verified by Voicesafe-36,Voice verification car security system. Authorized or enrolled users voice is stored in Voicesafe-36 system. In order to start the car the voice of the user is compared with the voice stored in database. If the voice pattern matches then the person is granted access and he can start the car. Live Voice detection feature enables genuine and real-time identification. Bad throat does not change the authenticity of the voice or vocal pattern. The car can be started even if you have a bad throat as long as you are a authorized user. Voicesafe-36 works for convertibles and sports cars too. Yes Voicesafe-36 works for convertibles and sports cars too. Voicesafe-36 works in all weather conditions and in noisy external circumstances. Yes it works in all weather conditions. Voicesafe-36 will identify and verify voice patterns/templates even at a whisper low decibels or even in loud day-light noisy traffic conditions. This features checks whether the voice is not a recorded one and is not played by an audio recorder or any other form of multimedia device. It confirms that a human being is actually attempting to gain access to the car. It then identifies if the voice belongs to the owner of the car or some unknown person by comparing it with voice sample stored in its memory bank. Thus it does 2 important functions. 1) Identifies if the voice is in its natural form and not merely a audio or multimedia recording. Thus it avoids manipulation of the original voice. 2) It Recognises ,Identifies and determines if the voice or the voice command given to start the car belongs to the owner of the car & not a unknown /unauthorized person. Hence this feature ensures that an unauthorized person does not start the car, thus enabling to increase security. What is a voiceprint? How many Voice prints does Voicesafe-36 store. Voicesafe-36 has a memory to store 6 voiceprints. A voiceprint is a digital representation of some of the unique characteristics of a callers voice. Person-Voice- verification & Person-Voice- Identification ? Voicesafe-36 uses voice verification for genuine results & not merely identification. In voice verification, a persons identity is confirmed by matching his or her voice against a single voiceprint or voice stored in Voicesafe-36 memory bank. The voiceprint matching is done for confirmation. Voicesafe-36 operates in voice verification mode & is very very accurate and safe. In Voice identification, the persons voiceprint is only matched against several voiceprints. This is typically done when no other identifying information is available, such as in the case of surveillance audio analysis or when a caller has forgotten his or her password or account number. Both speaker verification and speaker identification are types of voice biometrics. How is voice verification different from speech recognition? Speech recognition, sometimes referred to as voice recognition or automated speech recognition (ASR), is a technology that analyzes a voice sample to determine what was said, while voice biometrics analyzes a voice sample to determine who said it. In other words, ASR recognizes words, while voice biometrics recognizes identities. What is the difference between text dependent and text independent voice verification? The majority of voice verification systems are text dependent, meaning the user must state a specific word, phrase or digit sequence in order to be verified. This is ideal for combining knowledge verification (password, account number) with biometrics. There are some voice biometrics systems that are text independent, meaning a speaker can be verified based on any voice sample. This type of system is most suitable for systems that run in the background, such as for surveillance operations, where it is not possible to prompt the subject to state a specific word or phrase.Voicesafe-36 uses text independent method for 100% accuracy. It verifies if a human voice is actually attempting to gain access to the car. It then Identifies & Verifies if the voice belongs to the owner of the car. Thus allowing only Genuine & Authorized voice to start car. Voicesafe-09 is installed internally-on dash board & also externally-on car door thus securing unauthorized engine start and unauthorized car entry. If an unauthorized person attempt's to start the car or get access inside the car by placing his finger on the fingerprint scanner on the dashboard then the inbuilt dialer system calls up on your mobile phone number or your telephone number.It then warns you that the car was attempted to be stolen but it is safe now. It helps you store your unique and secret voice messages/appointments in the memory, which are secured by your finger impression. Thus enabling you a secured message & information storage facility. If you are driving the car & accidentally you fall asleep or start dosing off then the system will wake you up with small alarm or beeps.If you are not able to respond in three beeps then it shall with the help of Auto Dialer call the emergency number or the number of your relatives that has been stored.Thus avoiding an on-road calamity. Voicesafe-36 system has a deactivation code to deactivate the system if necessary or to drive the car incase your finger is swollen due to any health issues. Retinasafe-18 system has a deactivation code to deactivate the system if necessary or to drive the car incase your eyeball is swollen due to any health issues. (Retinasafe-18-ADVANCED),10 Eye ball pattern memory with Auto dialer,Car secretary & Nap Alert system. Retinasafe-18 is very easy to install & compatible with all car models & makes. 3 days in USA & Europe. 4 days to other countries. Shipping cost is 20 US$ extra. We ship by FedEx, UPS, BLUE DART.